A resource hub for food pantry clients and others in need of free and low cost services. The Information Station(I.S.) is a mobile resource hub staffed by trained volunteers. 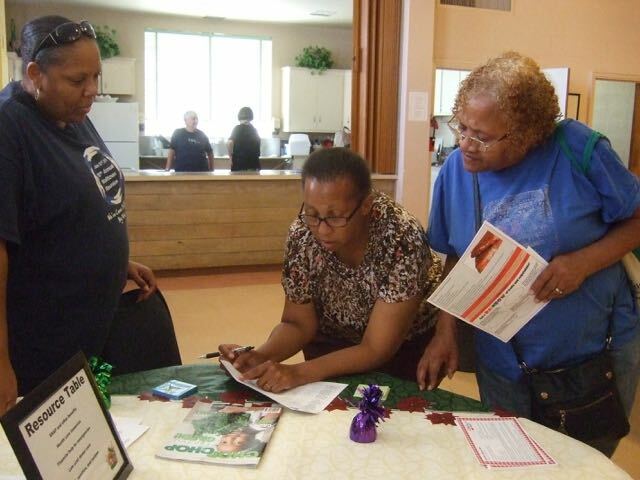 These Community Resource Workers offer contact information on community services and assistance with benefit programs to people attending food pantries, community health fairs and events. connection to service navigators for additional guidance on entitlement benefits eligibility and enrollment–SNAP, WIC, Medicaid, and Medicare. information about free or low cost sources of food, medical and dental care, housing, financial assistance, job training, and more. healthy recipes and nutrition tips from the Durham Dept. of Public Health, and fitness through Durham Parks and Recreation. The Information Station emerged from End Hunger Durham’s Food and More pilot projects, which encouraged food pantries to help people lead healthier and more financially stable lives. Access to resources improves access to food. Information Station Coordinator, Jacquelyn Blackwell, shows a food pantry client the list of food food resources in Durham. The Information Station served over 1,500 food pantry clients and other low income families in 2017 because access to more resources, improves access to food.